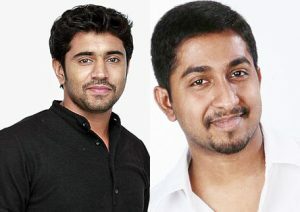 The forthcoming Vineeth Sreenivasan movie featuring Nivin Pauly in the lead role is titled ‘Jacobinte Swargarajyam’. The movie scripted by Vineeth himself has Dubai as the main location. The film also features Renji Panicker, Gautam Vasudev Menon, Sreenath Bhasi, Saikumar, Lakshmi Ramakrishnan, T G Ravi, and Dinesh Prabhakar. The movie is based on certain real life incidents and most of the characters are driven from individuals whom Vineeth has come across in his life. Shan Rehman is the music director. ‘Jacobinte Swargarajyam’ is produced by Noble Babu Thomas.